Hi Everyone! Thanks for stopping by. I don't normally build Abzan decks, so I'd love any suggestions you have. I've included the deck breakdown below! 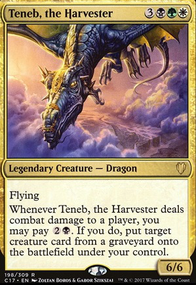 The theme of this deck is to put creature cards in your graveyard, swing with Teneb, and then bring the creatures back. I know that Teneb says that you can bring a creature back from a graveyard, but I decided to focus on utilizing my own graveyard instead of my opponents'. That's why I've included more discard-oriented cards as opposed to milling my opponents. Additionally, I know this isn't the best build, as I am not including signature cards like Angel of Despair and Ashen Rider. This is mostly due to the fact that I do not own these cards, but maybe over time when I expand my collection I'll be able to include them. I have similar reasoning for a lot of the unique cards in this deck (like having Greed as opposed to Phyrexian Arena, even though the art for Greed is infinitely better). However, please let me know if you have any suggestions on how to improve the deck! Please let me know if you have any questions or suggestions, I'd love to hear them!